Hassour Zainsubani is a Dunmer thief who can be found downstairs at the Ald Skar Inn in Ald'ruhn. He is an Operative for the Thieves Guild. Hassour made his wealth trading between his former Ashlander tribesmen and the Dunmer. He is knowledgeable in Ashlander customs and can offer you some valuable insight into how best to initiate contact with them. Hassour is very fond of poetry, especially Ashland Hymns and The Five Far Stars. His son, Hannat Zainsubani, has been missing for some time. "I am Hassour Zainsubani, %PCName. May you bless and be blessed. I do not wish to be rude, but if you have business, speak it, for I am at leisure, and would prefer to be alone with my thoughts." "Yes. What is your business with me?" "Welcome, my friend %PCName. Did you wish to ask about the Ashlanders and the Nerevarine cult? Or was there some other business you have with me?" Ashlander worship: "All Ashlanders in a tribe, young and small, are born into the Ancestor cult of their clan. 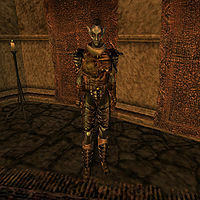 The Nerevarine cult is different, though; it is a very small cult, with only a few wise women with the gift of prophecy, and a few holy warrior-heroes who guard and protect the seers. Sul-Matuul, Ashkhan of the Urshilaku, is the Warrior-Protector of the cult, and Nibani Maesa, also of the Urshilaku, is the Oracle-Seer of the cult." "I hope you won't think me rude, but I rather not spend my leisure time lecturing strangers." "There is too much to tell. Here. Take these notes. I've written here what you should know about the Ashlanders and the Nerevarine cult. But most of all, if you are visiting a camp, there are things you should know about courtesy and challenges among the Ashlanders. And, since you ask about the Nerevarine cult, perhaps you'll be interested in my views on the Ashlanders and foreigners, because a guiding passion of the Nerevarine cult is their hatred of foreigners." Ashlanders and foreigners: "Most Ashlanders wish all foreigners and their false gods could be driven from Morrowind. At very least, Ashlanders wish the foreign devils would leave them in peace. Ashlanders think it shameful to attack unarmed persons, but they will kill without hesitation an armed person who offends them or their clan laws. No Ashlander is fool enough to make war against the Empire. However, if such a war might be won, many Ashlanders might cheerfully give their lives to win such a war." "I see. You wish to learn of Ashlanders from me. And what is it that you wish to learn?" What are their gift-giving customs? "A curious question. A gift is a sign of courtesy among strangers, and affection among friends. Among strangers, a thoughtful gift is a sign that you are cautious, and considerate, and aware of the other's wants and needs. Such is particularly useful for traders and travelers. Among friends, it is a private thing, and subtle, with great risks, for the test of the gift is how well it is tailored to the receiver." "I believe I have answered your questions about choosing a thoughtful gift. That was your business with me, was it not?" "Yes, my friend %PCName. You say you want to ask me some questions. What would you wish to know about the Ashlanders and the Nerevarine cult? Or perhaps you wish to know more about my life as a trader?" [The Five Far Stars has been removed from your inventory.] "This is a gift for me? A copy of "The Five Far Stars." Noble words of noble warriors. I gratefully accept your gift. My people have never loved the written word, and I lament their ignorant scorn for such common yet potent magic. I thank you, and I honor your courtesy, %PCName. It would please me to return your courtesy by answering your questions. What would you wish to know about the Ashlanders and the Nerevarine cult?" [Words of the Wind has been removed from your inventory.] "This is a gift for me? I am amazed. A copy of "Words of the Wind"? The words of the blessed mothers. I gratefully accept your gift. My people have never loved the written word, and I lament their ignorant scorn for such common yet potent magic. I thank you, and I honor your courtesy, %PCName. It would please me to return your courtesy by answering your questions. What would you wish to know about the Ashlanders and the Nerevarine cult?" [Ashland Hymns has been removed from your inventory.] "This is a gift for me? I am amazed. A copy of "Ashland Hymns"? Simple sentiments, simply stated. I gratefully accept your gift. My people have never loved the written word, and I lament their ignorant scorn for such common yet potent magic. I thank you, and I honor your courtesy, %PCName. It would please me to return your courtesy by answering your questions. What would you wish to know about the Ashlanders and the Nerevarine cult?" "Please take no offense, but I already own a copy of this book. But you could not know this, and it in no way diminishes the pleasure of your gift. Again, I thank you, and in return, I offer a gift of my experience of the Ashlands and its people. What would you wish to know about the Ashlanders and the Nerevarine cult?" challenges: "When challenged for sport, it is acceptable to decline. When challenged for honor, it is shameful to decline. Honor challenges come from offense given in speech or action, or may represent customary formal challenges of status or ritual." courtesy: "Ashlanders may challenge a stranger who enters a yurt without invitation. Customs differ with different tribes, but leave when requested, and you may be forgiven. Be particularly careful about ashkhans -- tribal chiefs -- and wise women -- tribal seers and counselors. Some are welcoming, some are hostile. Be courteous, and leave if requested. If offended, they may attack." disturbing dreams: "Perhaps it means nothing. It is peculiar, the tall figure in the golden mask. It puts me in mind of the golden helm of the Ordinator, but that does not seem to fit the... spirit of the dream. My people take careful account of dreams, but only a wise woman can tease from them their meanings." Hannat Zainsubani: "I wonder at my son -- he has been so long away, without a word to his father, surely he wishes me to die of worry, so he may inherit this fine brandy. He has proposed to chart the rarely visited ancient underground complex at Mamaea, west of Red Mountain; if you should chance to see him in your travels, chide him, and tell him an old man longs for news of his son-and-heir." Hassour Zainsubani: "I am a retired trader. I am well-traveled, and a man of letters, but I am proud of my Ashlander birth and heritage." life as a trader: "I am too old to travel, now, to risk the beasts and bitter blights of the Wastes. Now I sit here warm and savor my imported Cyrodilic brandy, while my adventurous son, Hannat Zainsubani, assists me in my trade, seeking out sources of fine ebony, and fetching them at fine prices." Maar Gan: "Maar Gan is a small village north of Ald'ruhn. A road runs from Ald'ruhn towards Gnisis to the northwest and Maar Gan to the north. Take the right branch at the fork to reach Maar Gan. But it is a long and difficult road, and outlanders may get lost. The silt strider goes from Ald'ruhn to Maar Gan. It costs little, and you don't risk getting lost." my trade: "I'm a trader. I know the Ashlands, their people and their ways. I know what they will buy and sell, and what will bring good money here among the settled people." "That is not a subject for idle conversation." "They worship the Great Ashkhan and Hortator, Nerevar Moon-and-Star, who in ages past destroyed the evil, godless dwarves and banished the treacherous Dagoth Ur and his foul hosts beneath Red Mountain. The cult is of small consequence in Ashlander worship, and only among the Urshilaku do its followers have any influence. Others Ashlanders tribes share the sentiments of the cult, but regard the Nerevarine prophecies with suspicion and skepticism." "I'm sorry, but that is not a topic for casual conversation with strangers." "I have heard it said that prophecies foretell the return of a reincarnated Nerevar, who shall drive the foreigners from the Ashlands and who shall cast down the false gods of the Temple, and restore the true worships of the Ancestors. It is a dream that would appeal to every Ashlander, but it is thought but a silly ancient legend, and little more, by many Ashlanders - myself included." "I understand. You wish to give me a suitable gift, but you do not know me well enough to choose such a gift, or you cannot find or afford a gift you know to be suitable for me. Well. Let us take your earnest thought and effort as a token of your gift. You have behaved courteously, and I am inclined to help you. What would you wish to know about the Ashlanders and the Nerevarine cult?" "Yes, I understand. Don't give it another thought. Now, what would you wish to know about the Ashlanders and the Nerevarine cult?" Urshilaku: "The Urshilaku are the Ashlanders of the northern Ashlands and the West Gash, in the northwest of Vvardenfell. Ashkhan Sul-Matuul is their chief, a brave and respected war leader, and Warrior-Protector of the Nerevarine cult. The Urshilaku camp moves with the herds, but usually lies close to the Sea of Ghosts." Urshilaku camp: "The Urshilaku camp moves with the herds, but usually lies close to the Sea of Ghosts, north of the village of Maar Gan, on the northern coast of Vvardenfell." This page was last modified on 10 May 2018, at 14:20.